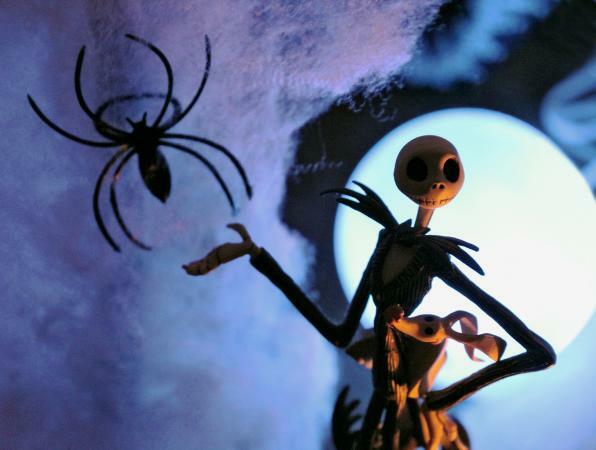 If you're a big fan of Tim Burton films and are "simply meant to be" with your partner, why not promise your love to one another with a set of Nightmare Before Christmas engagement rings? You can buy rings that are already designed with the movie in mind or have one custom made to reflect your special love story and your love of the movie. There are a few different types of Nightmare Before Christmas rings that are currently available. In some cases, they're customizable and still extremely affordable. Others are sold as they are. This design is sold by Spiffing Jewelry for just over $100.00 for sterling silver or just over $700.00 for 14K white or yellow gold (base price). It features the words "Simply meant to be" along the inside of the band. Rings are available in sizes four to 15, and the center stone can be clear CZ, moissanite, black CZ, black diamond, purple CZ, or amethyst. Prices will vary based on the center stone you choose. Some are included in the price, while others could add $40.00 (amethyst) to $650.00 (black diamond) more to the price. These rings are typically shipped two weeks after the order is placed since they're customized. The ring comes in a branded black jewelry box, but there's a handmade wooden Nightmare Before Christmas Ring Book available for about $25.00, which has a velvet liner to hold the ring. If you're looking for a simple his and hers Nightmare Before Christmas set, Hot Topic has you covered for less than $20.00. Each ring is black and silver in tone and features the words, "We're simply meant to be." Neither ring has a center stone, which keeps the cost down. The downside is a lack of customizability, as these matching rings only come in a set with a size six and size 10. They come in a coffin clasp box that features Jack and holds both rings and two bead shot chains. If there's no store near you with these in stock, expect to pay about $5.00 for shipping. If you spend at least $20.00 and have a store near you (US only), you can have the rings shipped there for free. Unused rings can be returned with a receipt within 60 days. The When Jack Met Sally - Nightmare Engagement Ring by Earth Art Gem & Jewelry, sold by Custom Made, is inspired by the scene from the movie when Jack and Sally meet at the top of a snowy hill. The background is a natural Swiss blue topaz, while Jack and Sally are represented by tiny diamonds and Zero, the dog, is an orange topaz. The scene doesn't stop above the blue topaz; the "river" continues down the side in a string of natural black spinel. This piece is customizable as well. The stones stay the same, but the metal can be sterling silver, 10K white gold, 14K white gold, palladium, or platinum. Ring sizes go from four to 12, and shipping is free (this design ships in two weeks). The base price for the sterling silver ring is around $400.00, but the price will increase anywhere from $380.00 to $1150.00 if you choose a different metal. The Jack and Sally couple's ring set sold by Vancaro would be ideal for a couple looking for a quirky set of his and hers engagement rings. The smooth titanium rings are engraved with an image of Jack's face for him and Sally's face for her, with each character in an adoring gaze. 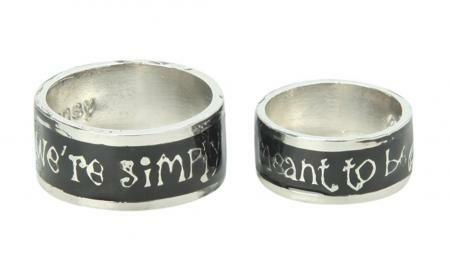 The inside of the rings are engraved with the movie phrase "Meant to be" and have an 8mm width. At about $100, it is an affordable set that is still excellent quality. Reviewers give the rings positive reviews, praising the craftsmanship, comfort, and style. The woman's ring is available in sizes five through nine, and the man's ring in sizes six through 12. Shipping is free on all orders, and returns are accepted within 30 days along with a receipt as long as merchandise is unused. If you and your significant other adore the Nightmare Before Christmas movie, this may be the type of ring that perfectly represents your love story. Once that's narrowed down, you still have styles to choose from, whether dainty, elegant, and featuring a single center stone; a his and hers set, or a more elaborate scene played out right there at the base of her finger. Weigh the pros and cons of different metals, from price to durability, make a choice, and decide on how you'd like to propose. There's no better feeling than finding the ring that's simply meant to be.